Rahm has brooked no dissention, using the remap to vanquish those who had the nerve to question and oppose them. That is what happened to Mayor Opponent Bob Fioretti, whose longtime 2nd Ward was moved from its eternal spot of downtown and the beginning of the South Side, to far flung reaches onto the other side of town. Rahm when he couldn't remap his enemies, put money into candidates against those who questioned him. Including 8 of the 9 largest $$$$ recipients from Rahm's SuperPac. I think it's a beautiful thing. As it breaks down now, Chicago is one third Black, White, and Latino. Mr. Garcia has a base in the Latino Community. Rahm will win the White Vote. That means the route to the 5th Floor (The Mayor's Office) will run through the Black Community. Rahm won 6 of them. Black Candidate Willie Wilson won 8. Mr. Wilson, so far, has declined to endorse Rahm. I can understand Black folks' hesitation in putting their support behind Mr. Garcia. The bonds between the Latino and Black community have been strained over the years, due to certain political decisions by certain Latino politicians (looking at you Luis Gutierrez, and the heads of the HDO)..
And, they say that Mr. Garcia is the real deal, and that we can approach him as an ally. I do know that Mr. Garcia comes across as a true public servant, and his humbleness comes through in the few ads that he was able to get on tv during the primary. What I know for sure is that Mr. Garcia, who is a former Alderman, State Senator, and now on the Cook County Board of Commissioners. Chuy knows how government works, and how to make it work. Don't let ANYONE convince you that the man, who got into politics with Harold Washington, isn't qualified to be Mayor. He may not be 'polished', but I don't need 'polished. Chuy lives in the Little Village neighborhood. He has stayed to live among 'the people'. That matters to me. He understands what the average Chicagoan who gets up and goes to work and wants to live in the city that they loved is going through. A radio host that I respect was disappointed that Chuy was the second choice, and thus, the runoff candidate against Rahm. 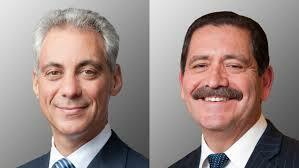 He thought that Chuy was the' weaker of the choices'. I disagreed with his assessment. I disagreed with him because it was plain that Rahm couldn't break 45%. Oh, they had some bullshyt poll from the Tribune that had Rahm at 48%, which I thought was bogus and propaganda only to discourage people from coming out because they thought that Rahm couldn't be beat. Make no mistake, TPTB wanted no runoff. They wanted a low turnout election, because they believed it favored Rahm. Rahm was 'inevitable'. Rahm had all the money. All the endorsements. All the slick ads. What Rahm didn't have was the people behind him. Mr. Garcia was polling in the 20's all throughout the race. He wound up at 34%, which means that damn near every undecided voter in Chicago decided to go his way on election day. None of the undecideds gave Rahm a second chance. 55% of Chicago said that Rahm had to go. Now, the election is ON! For the Latino community, I believe where will be more voter registration in the community, because, like the Black community in 1983, they see the possibility of one of ' their own' can occupy that office on the Fifth Floor. There are the White Progressives who never liked Rahm, and would relish the chance to get rid of him. And then, there are Black folks like me, who have been seething ever since he was elected on the backs of Black folks four years ago. Rahm did everything I thought he would do, and for those Black folks - because it was Black folk that put him in office - you owe the rest of us an apology. Nobody would walk over broken glass for him. And, it's about to show. Why does Rahm need to go? Rahm’s arrogance knew no bounds. It wasn’t just the closing of 55 schools in BLACK NEIGHBORHOODS.. It was turning around and giving the money – that they said wasn’t there to help improve the public schools.. But, the ability to find $125 million dollars for a stadium for DEPAUL who hasn’t had a winning team since I was a child. It wasn't just closing 55 schools in Black neighborhoods.. But finding 20 million dollars for an expansion annex for a public school in the richest part of town…. Finding 17 million dollars for an expansion of Walter Payton College Prep - a selective enrollment school on the North Side.. It was deciding to put the Barack Obama College Preparatory School ON THE NORTH SIDE, and then have the nerve to say that the selective enrollment school was going to save THIRTY PERCENT of its slots for 'neighborhood residents'. He has since rescinded that decision, but we got the point the first time, and you best believe if he's re-elected, back to the NORTH SIDE that school will go. It was his fundamental disrespect of Black people…. I could be with you here for hours discussing my rage everytime I drive by the one closest to my house and how utterly ridiculous they are. And, don’t get me started on Chicago Snow Etiquette. I have never seen the streets of Chicago look this bad after a snow…in the post-Bilandic era. I’m not just talking about the South Side…. I’m talking about DOWNTOWN CHICAGO looking pitiful after a snowstorm. Then, I could begin with you on the scam of the new paying system with the Chicago Transit Authority, when nothing was wrong with the old way we paid on the CTA, except for nobody was making money off of it. I don't know what kind of Mayor Mr. Garcia would make. But, I'm willing to give him a chance. I know his life is closer to the one that I lead. I know that the people he is around everyday have lives similar to mine. And, that their problems of living in an urban area are akin to mine. If Mr. Garcia doesn't do a good job, then, as my civic responsibility in four years, I will work to vote him out of office. But, it's time someone other than the 1% got heard at City Hall. Chicago's first Jewish mayor. He is quite handsome I must say. It seems he and Spike Lee got into a bit of a row about his film. I'm not a big Spike Lee Fan any way. "According to Lee, Emanuel went to great lengths to make production of the film difficult, particularly over the film’s title. After being “summoned” by the mayor to City Hall in April during pre-production, Lee tells Chicago magazine he and Emanuel “got off on the wrong foot,” as the mayor attempted to portray him as a villain for bringing some of the city’s biggest problems to light." "I’m generally not attracted to Black women…physically, mentally or otherwise. I typically don’t have much in common with them. To be honest, I don’t think I could deal with most Black women…and I don’t have any interest in going down that road….although I don’t exclude the possibility of meeting and dating one." Just wanted to say...things have changed for Black women drastically since 2009. So many are waking up and fed up with the above type of behavior. More and more are going for men who appreciate them and don't belittle and stereotype them. There are plenty of cute white, asian and latino and a few Black men (smh) who care for Black women. So you shouldn't feel the need to reference BW in your future posts, we've moved on.